Join one of our naturalists for programs and events or stop in on your visit to Brecksville Reservation. 9000 Chippewa Creek Drive Brecksville, OH 44141. Brecksville Nature Center is an excellent representation of 1930s WPA craftsmanship and architecture and is on the National Register of Historic Places. 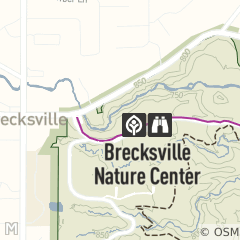 Brecksville Nature Center - A Beautiful History Brecksville Nature Center was created in 1939 by Works Progress Administration craftsmen. Excellent examples of chestnut carpentry with curved walnut leaves, wrought iron work and native stones grace the building inside and out. A fascinating wildlife feeding area attracts native mammals and birds year-round. In winter months, eager chickadees will often land in visitors' hands for sunflower seeds. Brecksville Nature Center opened its doors on June 11, 1939 as a WPA era Trailside Museum. It remains to this day the last of Cleveland Metroparks original trailside museums. The nature center serves as a place for people to gather and extend their experience of the reservation by being introduced to the wilderness, beauty and treasures of the past that await discovery. Personal encounters with wildlife play a major role at the center. One of the most popular winter programs is Hand Feed a Chickadee, which has a history dating back to the 1940s. Explore the historical impact of the WPA and CCC federal programs in Cleveland Metroparks. Join in on this morning hike through forest and fields.